Every sacred mantra is a spiritual calling tool and treasure. Da Bei Zhou is one of the highest sacred mantras known to humanity because it calls Guan Yin, the Bodhisattva of Compassion, and eighty-seven other highest buddhas, as well as their entire lineage and countless spiritual beings who have chanted Da Bei Zhou from pre-history. The blessings Da Bei Zhou can bring are unlimited. You could be moved to learn and chant Da Bei Zhou yourself. The blessings you can receive are beyond unlimited. 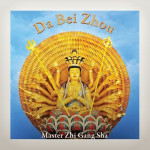 On this CD Master Sha’s chanting is complemented by orchestral music from Heaven flowed by Chun-Yen Chiang, the first Divine Music Composer created by the Divine through Master Sha.